While it has been on the market for close to a year now. I wanted to take the time to review one of my favorite RVs at this time. The Highland Ridge Roamer RF347RES. 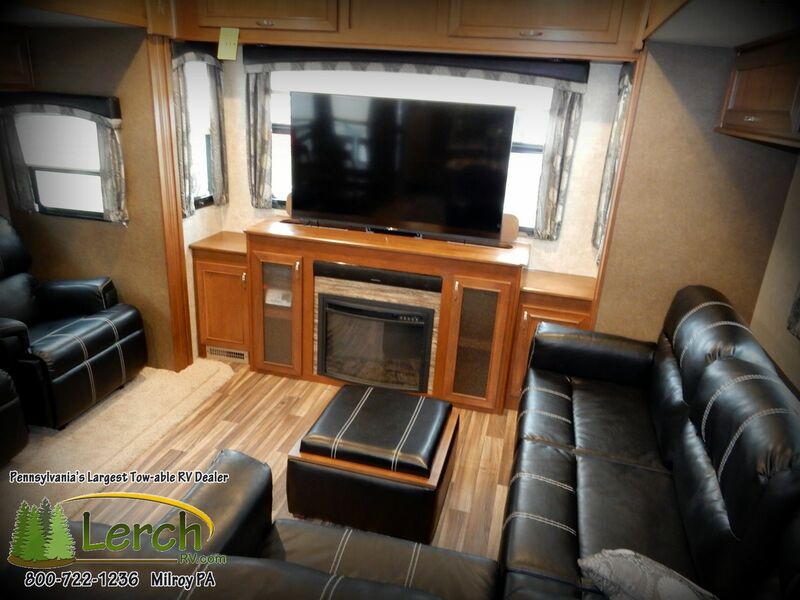 This rear entertainment/living room fifth wheel RV offers comfort and livability. The Roamer line of 5th wheels are designed with the seasoned traveler in mind. You’ll find floor-plans designed for extended use that maximize space while keeping weight to a minimum. Wide body construction and 42” deep slides lend a sense of space that’s just not achievable with lesser products. From brand name appliances to Corian counter-tops, you’ll find feature content that the accomplished RV owner will appreciate. Rugged construction, top quality materials and leading edge innovation. If you’re serious about the RV lifestyle, this is your fifth wheel. Equipped with a slide out King master suite up front with under bed storage, large slide glass door wardrobe, dresser, closet with washer/dryer prep, and a solid privacy door. The private bathroom features a residential sized shower with glass shower enclosure, medicine cabinet, linen cabinet, and porcelain toilet. The living area features opposing slide outs that offer plenty of room. The main slide offers dual wall hugging recliners as well as a free-standing dinette table and chairs. The rear entertainment center is backed by a large window that allows plenty of natural light in. Here a large 50″ LED TV on electric lift can be found. As well as a sound bar entertainment system and electric fireplace. The new ‘L’ shaped sectional style sofa features a built-in tri-fold sleeper sofa, and is very comfortable to relax on. 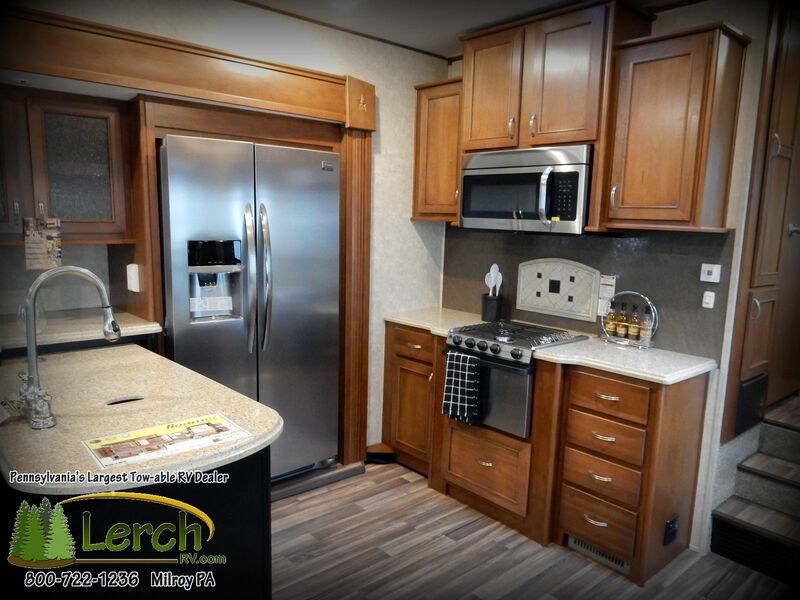 The highlight of this exciting four season Open Range RV, is the kitchen. With the help of a large solid surface counter top area, the kitchen feels separated from the living area. All the essentials of home can be found here. Including a large side by side residential stainless steel refrigerator with ice and water. A stainless steel three burner range with oven, large over the range stainless steel microwave, high-rise faucet, and plenty of storage, can be all found in the kitchen. 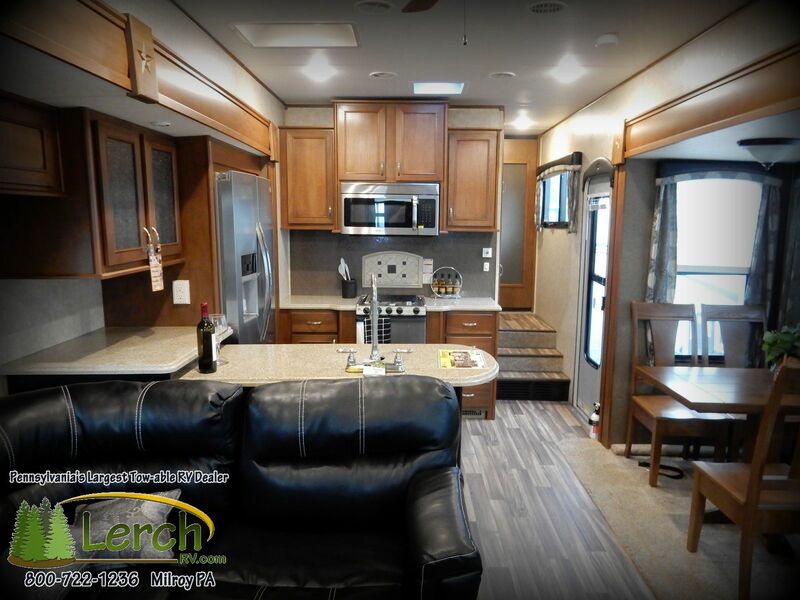 A fully ducted 15K BTU AC, direct heated and enclosed underbelly, along with a fully ducted high performance furnace, will keep this Roamer RF347RES comfortable all camping season long. Outside features include a true auto leveling system with lock arm stabilizer bars, a rear roof ladder, outside security lights, raised cap for stack-able washer/dryer installations, power patio awning with LED lighting, full view entrance door, aluminum wheels, outside convenience center and much more. It’s not so much camping as it is glamping. But this exciting Roamer RF347RES is ready to be towed to your favorite camping spot. For more information about one of my favorite RVs or to schedule an appointment today to see one. Contact us here or at 800-722-1236. Lower gas prices may be on the way for U.S. consumers by this summer if refinery maintenance ends smoothly and crude oil remains relatively cheap, AAA said in a news release. As reported by the St. Augustine Record, the travel company’s release said it is even possible that gas prices will return to near $2 per gallon in some areas, as long as there are no unexpected problems in the meantime. AAA does not expect the national average to rise above $3 per gallon this year. “There is a real hope that gas prices could drop significantly in time for the busy summer driving season,” said Mark Jenkins, AAA spokesman. “The overall outlook looks good for drivers, and with any luck we will avoid the types of problems that often lead to higher gas prices at this time of year.” Many refineries have completed seasonal maintenance, though unexpected problems could still occur. Many refineries and wholesalers will switch to more expensive summer-blend gasoline by May 1 to meet EPA clean air regulations. The cost of crude oil is likely to be the most important factor influencing gas prices over the next few months. At the close of Friday’s formal trading, WTI settled at $49.55 per barrel — 68 cents higher than the week before. Many experts believe that crude oil prices may drop further due to abundant supplies, but international conflict, declining production or other issues could result in higher prices. News from around the campfire. – Harrisburg, Pa. – Two preview hikes will be held prior to the Keystone Trails Association’s (KTA) sixth annual Susquehanna Super Hike & Ultra Trail Run, according to Gant Daily. These are hikes at a normal, brisk pace to familiarize prospective participants with the course and its challenges, Gant Daily explained. The first preview hike is June 28. It will be at Pequea Creek Campground and is approximately 12 miles. Gant Daily noted hikers should bring water and lunch. The second preview hike is July 12. It will be at Lock 12 to Otter Creek Campground and is approximately 15 miles. Hikers should meet at Otter Creek Campground at 9 a.m.
– Pennsylvania’s governor, Tom Corbett, wants to balance the budget, in part by leasing state park and forest acreage for gas development. Not so fast, say two former officials for state parks and natural resources departments. The two officials spoke in court on behalf of an environmental group trying to put a stop to the idea. – Three new one-hour episodes of Extreme RVs will air this Sunday evening, June 15, on the Travel Channel, including a massive toy hauler, a $2 million custom Prevost, and a Sprinter van conversion. – St. Cloud, Minn. — Pleasureland RV Center owner Dan Pearson has come to the assistance of law enforcement once again, this time footing the bill for a bloodhound that replaces one who used to work for the Stearns County Sheriff’s Office until it died unexpectedly late last year, the St. Cloud Times reported. – As of June 9, advanced reservations for the Father’s Day weekend (June 13 to 15) were running 5.6 percent ahead of the same period in 2013. A total of 22,150 reservations had been made, representing a total of 56,100 camping nights. – Anaconda, Mont. — Anaconda Police Chief Tim Barkell said a camper discovered a jawbone Tuesday night at the Warm Springs Creek Campground, Mont., according to NBC Montana.Police and a medical examiner were called to the scene, and also found ribs in the dirt, NBC Montana reported. Barkell said he believes the site may be an old settler or tribal burial ground. NBC Montana noted the Montana Historical Society has taken over the scene, Barkell said, and will run tests to determine how old the bones are. – Butte, Mont. — At least seven mobile home owners have been told to leave the KOA in Butte, leaving some who have lived there for years scrambling to find another place, according to The Montana Standard. Joseph Tice, a new majority owner of the campground off of Kaw Avenue, had a letter distributed to them last week explaining the final conversion of the property to an overnight campground was beginning. He is giving them 90 days to leave, The Montana Standard reported. Tice said KOA, which oversees the national franchise business, said KOAs are more successful if operated solely as overnight campgrounds so he has decided to stop renting spaces to mobile homes on a monthly basis, The Montana Standard explained. – Minneapolis, MN — High school carpenters have nearly finished three camper cabins for the new Whitetail Woods Regional Park, and they are on schedule to be trucked out to the park in July, Star Tribune explained. Over the school year, 41 students came from their high schools to take construction trades classes at Dakota County Technical College, where they built the one-room cabins, according to Star Tribune. Their free labor made the cabins affordable for Dakota County, allowing the county to add the popular overnight getaways as a key draw for the new 425-acre park, set to open in September, Star Tribune reported. – Campers have discovered what appears to be an ancient elephant skull at Elephant Butte Lake State Park. “State Parks and other agencies are investigating the find of what appears to be a tusk and skull of a prehistoric elephant,” said State Parks Director Tommy Mutz in a news release from the New Mexico Energy, Minerals and Natural Resources Department. The release characterized the find as a possible stegomastodon. According to the University of Nebraska State Museum, which helped in the excavation of a stegomastodon found in Nebraska, the species went extinct around 1.3 million years ago. Paleontologists at the New Mexico Museum of Natural History and Science are working with State Parks and U.S. Bureau of Reclamation staff to safeguard, investigate and potentially excavate the fossil as soon as possible, the release states. Campers reported the find to authorities, said Dr. Robert Stokes, State Parks Archaeologist. “State and federal law prohibit the removal of archeological, paleontological and botanical specimens from Elephant Butte Lake State Park,” Stokes said. Once the investigation is complete, State Parks will work with other agencies to provide the public with information about the age and type of fossil skull found, the release states. ~ update–Kristian Horn, who used to be a purchasing agent for RV manufacturer Forest River, has been sentenced to three years in prison. An Indiana court found him guilty of stealing company materials and selling them at about a third of their original price. Horn will also be paying restitution. ~ Update on RVers who scooped up a newborn seal pup on a California beach and were making a getaway. Two volunteers from Monterey, California’s Marine Mammal Center got a tip about the seal-napping, gave chase in their BMW and somehow contacted the RV driver by phone. The RVer agreed to stop, and the duo found the seal stashed under a pile of dirty clothes. “Beemer Cruise” is being readied for a future return to the wild. It’s not clear if the RVer will be charged. ~ If Zibby Wilder has her way, you may soon stay at Chillville in an Air-stream. The food-and-wine writer wants to set up five “amenity rich” Air-stream trailers on Walla Walla, Washington’s airport industrial property to form a “glamping” resort complete with a communal gas fire-pit, pétanque courts and picnic tables. No other RVs would be allowed admittance. ~ A man stole a motor-home north of Seattle, Wash., then led several law enforcement agencies on a wild chase for an hour, driving through oncoming traffic then smashing into five cars and two homes in Granite Falls, Wash. The thief abandoned the rig then ran several blocks while shedding his clothes. He barged into a house and when the occupants refused his request for clothing, he took a pair of women’s jeans and a top and ran out of the house into the open arms of police. One person was taken to the hospital with unknown injuries. ~ Petersburg, Ky. – Authorities said an alleged campsite burglar and vandal was arrested Tuesday after he was found face down in Boone County cornfield, FOX 19 reported. The man, identified as 35-year-old Luthor Robinson, was reportedly wearing shorts taken from the campsite. The shorts were belted with a cable television wire cut from one of the sites, FOX 19 explained. Authorities told FOX 19 most of the stolen property was recovered, including two guitars, a handgun, two flat screen televisions, a portable boom box and a battery jump box. Damage to the sites included broken windows, kicked in doors, two jet skis sunken and damaged boat controls. -“Project Terry,” which took a moldering 1978 Terry travel trailer and renovated it “extreme makeover” fashion, will soon get a new owner. The industry-supported project’s “child” is presently on display at the RV/MH Hall of Fame in Elkhart, Ind., but come the end of May it will be auctioned off on eBay. Proceeds will be donated to the Hall of Fame. -The Mozingo Lake Advisory Board in Maryville, Mo. discussed a new rate card for RV campers who stay more than 10 nights. The rate card could potentially save campers 10 percent. -Ohio officials said Wednesday they’ll invest $88.5 million to upgrade and modernize trails, campgrounds and recreational facilities in Ohio’s 74 state parks over the next two years. -RV builder Jayco says it’s working hard to be eco-friendly. In 2013, under its EcoAdvantage program, the company says it recycled materials to the tune of 1,284 tons of wood, 13,221 tons of scrap metal and 1,801 tons of paper and cardboard. That amounts to enough space in a landfill to handle the needs of 42,500 people. -Bass Pro Shops offers free activities for kids May 3 – 4 (April 22, 2014) — This special event May 3 and 4 will give kids the opportunity to learn skills such as knot tying, rod casting and archery, which will help them have fun outdoors. Kids who complete all activities can receive a free fishing tackle box. -SOUTH BEND, Ind. — Officials from the Recreation Vehicle Industry Association estimate that an additional 2,000 drivers are needed to deliver the 25,000 to 30,000 recreational vehicles that are sitting on lots in southern Michigan and northern Indiana, mostly in Elkhart County, according to South Bend Tribune. The problem could cost the industry as much as $500 million in lost sales in 2014, according to South Bend Tribune. -Catch a fish — win $10,000: Bass Lake, Calif., sounds like a place you could land a big one. Come May 3rd and 4th, the “big ones” the anglers will try to grab will be trout. More than 1,000 tagged rainbows will be released prior to the 33rd Annual Bass Lake Fishing Derby that weekend. -York Beach Camper Park owner Diane Spear finally got her first vacation in a year. On returning to her Portsmouth, N.H., park she got quite a shock: The local power company had planted a power pole in the entrance, blocking motor home access to the park. On hearing of the snarl, local selectmen rescinded their permission for the pole placement, and the pole (and its hole) are now gone. Case not closed — the power people say they must have a pole somewhere to get juice into the campground. -ESTACADA, Ore. – A Washington State RVer has filed suit, asking for $275,000 for damages she suffered when a duck attacked her as she stepped out of her motor home in Estacada. – A large recreational vehicle crashed on the Kilpatrick Turnpike after leading Oklahoma City police on a chase, Thursday night. The chase started near on Interstate 40, near Rockwell, News 9 reports. Police say the suspect, who was driving a large white RV, had felony drug warrants out for his arrest. Oklahoma City Police tell News 9 police went out to the RV park near I-40 and Council Rd. to serve three felony warrants on 30-year-old Richard Parver, when he and a female fled in the RV. The chase lasted over 30 minutes, winding around the metro. The RV ran over several stop sticks before finally crashing out and catching fire on the Kilpatrick Turnpike, near County Line Rd, News 9 explains. – A 35-year-old travel trailer yielded up some secrets to its new owners. In a small black box, hidden away inside the trailer, were military medals belonging to a man dead since 2001. Evidently, Dr. Edwin Harrison, the sixth president of Georgia Tech, hid the medals inside sometime before his death. After the trailer changed hands, new owners found the box and went on a “treasure hunt” to find the owner. They recently turned over the box and its contents to Harrison’s son in Cobb County, Georgia. – Authorities tell WKBN a Youngstown man has died after being burned by a fire that was sparked by a space heater at Green Acres Lake Park in Diamond, Ohio. – For the ninth consecutive year, Camping World RV Sales was announced as America’s No. 1 seller of tow-able and motorized RVs for 2013 by Statistical Surveys. Camping World RV dealerships amassed 47 individual dealer awards for being the top-in-class in their respective states. Due to having the largest amount of sales locations. – BOGO (buy one, get one) offers abound, and Kentucky State Parks are joining in. Buy one night of camping in April or May, get the second night free, Sunday through Thursday. Use the promo code “SPRING14” on the state parks’ Internet reservation system. – Make my day? A campground manager in West, Texas, had his own Clint Eastwood moment when he found three folks who appeared to be planning to steal LP cylinders from rigs in his campground. The manager brandished a shotgun and ultimately discharged it, hitting one. Not too bright to argue with an armed man — but it figures — one of the would-be burglars was named Looney. – BANTAM, Conn. : A man charged for accidentally setting a camper ablaze while horsing around with friends led state police right to his stash of marijuana plants, according to Register Citizen. A state trooper investigating a trailer fire at the home of 18-year-old Christopher Jacquier and his mother, discovered several potted marijuana plants. Register Citizen explains 13 plants, or nearly a pound of marijuana, were seized from the property, along with rolling papers, a small baggy of marijuana, an electronic scale, a pipe with burnt residue and a water bong. Jacquier told authorities investigating a fire he accidentally set a trailer ablaze while burning scrap wood. He told authorities he asked his mother for permission to burn the trailer, but she wouldn’t let him, Register Citizen reports. – A man was jailed Monday after he led police on a wild chase through Placer County, Fla. that ended with several trailers damaged, according to KCRA. The Placer County Sheriff’s Department told KCRA the man downed a large number of prescription pills in a suicide attempt, then drove off. The man was drinking beers as deputies followed him. The chase ended in an RV park in Colfax. The driver smashed into several trailers, causing significant damage, KCRA reports. Since the acquisition of Open Range RV by Jayco RV. Changes have been minor just as promised from both RV manufacturers. However with new business licensing requirements. A new stable has come to Open Range RV. Highland Ridge RV is now considered the new home of Open Range RV. A new website will be up and running shortly; highlandridgerv.com. Open Range RV and Jayco entered into a Letter of Intent with Jayco Corporation near the end of February 2014. With similar cultures and dedication to both their customers and dealers. The acquisition of Open Range RV by Jayco will have a result that everyone will benefit from. Both companies have a track record of exceptional growth in RV sales over the past couple of years. As an Open Range dealership, we look forward to a great new opportunity to introduce this innovative RV product to our customers. So be on the lookout for Open Range travel trailer or fifth wheel camper by Highland Ridge RV. New ownership but the same quality built, innovative designed RV for the camping family. – York, PA: The York Campers World RV Show was held in York, Pa., the second weekend of March, as has been done for the past 36 years. The 14 RV dealers present reported brisk sales, and a total of 180 units were shown on over 130,000 square feet of indoor space and 38 units were outside on the York Expo Center ground, said Beverly Gruber, executive director of the Pennsylvania Campground Owners Association. “Fifty campgrounds showcased their facilities and talked with the customers about the advantages of coming to their park,” she explained. Indiana: Indiana’s state parks and reservoirs are looking for volunteers to serve as campground hosts in exchange for free camping. Hosts work a minimum of 20 hours per week. Sites looking for hosts to volunteer in April are Turkey Run, Indiana Dunes, Potato Creek and Spring Mill state parks. Raccoon State Recreation Area needs a host June 29 through August 3, the entire length, or in two-week periods. A complete list of sites and information on hosting duties is here. If interested, contact the site directly. Nationwide: RV dealers are expecting big things this year, according to results from a Recreation Vehicle Dealers Association (RVDA) survey conducted in late January to early February. In the March issue of RV Executive Today, RVDA reported that after a good 2013, the majority of survey respondents are expecting 2014 to be even better. Specifically, 68% of dealers who participated in the survey feel the outlook for the retail market this year will be better than it was in 2013. Another 32% believe the market will be about the same as it was last year. – Manlius, NY: The Great Outdoors RV Superstore in Fulton, N.Y., is proposing to build a satellite recreational vehicle/trailer sales office on the site of the former Fremont Lanes Bowling Alley in the town of Manlius, according to the Syracuse Post-Standard.The Post-Standard reports that a small sales office would be built on the now-vacant 2.5-acre site, with 12 parking spaces and room to park 23 RVs/trailers. The site would open this spring, as soon as the proper permits are secured, Doug Miller, engineer for the town of Manlius told the Post-Standard. The bowling alley was demolished several years ago. – Three people were badly burned after an RV burst into flames at a Delta, British Columbia, gas station March 15. According to police, the occupants were siphoning fuel through a trap door in the vehicle, which they parked above the underground holding tank. Investigators haven’t confirmed where the stolen gas was intended to be sold, but said it sometimes is advertised on Craigslist. – Alexandria, LA: Tips about odd smells led to the arrest of a Deville man who allegedly was operating a meth lab in a small camper, according to The Town Talk. Deputies went to the camper Wednesday in Deville to follow-up on the tips about the smells and suspicions that meth was being made. John Loyd Paul Jr. answered the door, and deputies smelled “a distinct chemical odor,” according to The Town Talk. A deputy who entered the camper to get a gun saw a pan with suspected meth drying on a heating blanket, The Town Talk reports. Paul was arrested and charged with possession of a controlled dangerous substance II, creation/operation of a clandestine lab, possession of a firearm by a convicted felon, possession of a firearm with an obliterated serial number, illegal carrying of weapons with drugs and possession of drug paraphernalia.